Remove GPS Data from iPhone Pictures — Mickler & Associates, Inc. The iPhone, like many modern cell phones, can take pictures. When those pictures are taken, information about the location of where the picture was taken is embedded into the photo. This is called metadata, and specifically it's referred to as a geotag. Geotags are an interesting feature in that they can be pulled up on a map, then, sequenced in time to replay where you were when the photo was taken, even down to the very accurate location of a room within a household. Very clever and fun. Until you start thinking about children using iPhones - their privacy and security become compromised in that it lays out a predictable pattern of their whereabouts. Photos (along with the metadata) are uploaded conveniently into social media networks and distributed to whomever in uncontrolled ways. This date is also used by professional computer forensics technicians (hey, like me!) to identify potential evidence in the court of law. Further, if someone wanted to "case" another (a term used in hacking meaning we collect personal private information about individuals in order to break into their accounts), geotagging provides a unique and easy exploit. Imagine a stalker determining the predictable locations and timing to harm a victim? 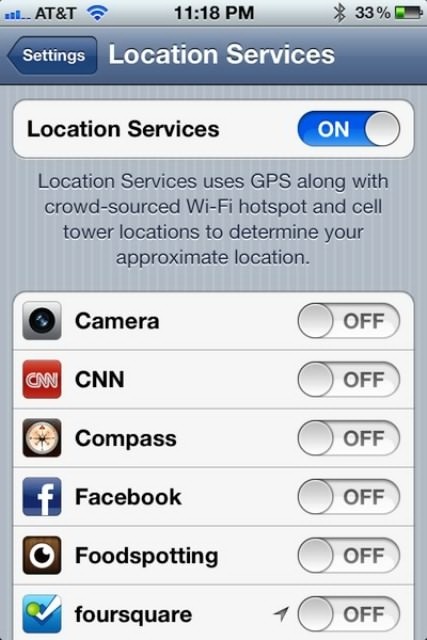 So ... You may be curious on how to turn off geotagging on your iPhone or iPad. 4. Camera Setting and flip to OFF position. Doing this will prevent the device from storing geo-tag metadata in future photographs. The photos you've already taken and uploaded probably already have the geotag information in them and it cannot be removed, other than deleting the photo, or, Using an app like deGeo (you can find it in the iTunes App Store). It's not perfect, but it is one step you can take to control the distribution of your whereabouts, and the whereabouts, safety, and privacy of your children.